Welcome to Rowan University! We are glad you have chosen Rowan University and look forward to seeing you at an upcoming orientation program. 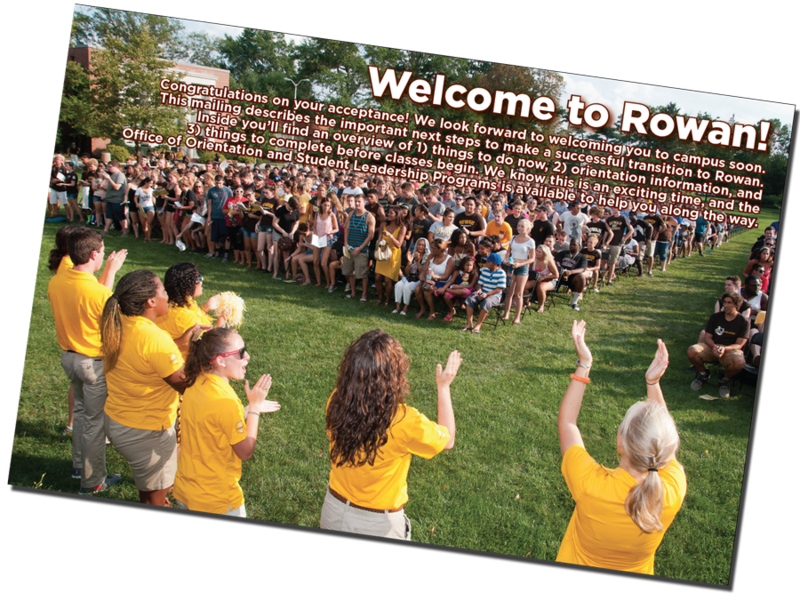 Orientation will introduce you to the culture, traditions, and expectations of Rowan University and assist you in selecting your first term class schedule. Attendance and participation at a new student orientation program is required for all new first year and transfer students. Orientation provides you with the information and access to resources you need to have a successful college experience.Parents are also invited to attend orientation to learn more about how you can support your Rowan student. Family members who have attended orientation find it to be an informative and rewarding experience. Students and family members will follow different schedules during orientation sessions. Students must reserve a spot to attend orientation in advance. We utilize an online reservation system that displays specific dates available according to major. Not every date may be offered for all majors, and sessions will close when maximum capacities are reached. Please use the orientation reservation system to view dates currently available for your major(s). We expect students to make their own reservations for orientation (and to make the parent & family reservations as well). Students are responsible for managing their Rowan Network and Banner account information and keeping this information safe and secure. Students should not share this information with anyone in order to protect the confidentiality of student records. See the complete Acceptable Use Policy for more information. We expect students to attend all orientation activities. All sessions during orientation are required and programming is specifically designed to assist students with their academic and social transition to the University. It is our goal for students to build a relationship with their advisors as well as learn the necessary skills to register on their own in future terms. Therefore, we expect students to register for classes with the assistance of the professional academic advisors only, and not their parents or family members. We expect students to follow all University policies, as well as all applicable laws and ordinances, including rules prohibiting alcohol and drug use. Failure to comply with these rules can result in dismissal from orientation without being permitted to register for classes, termination of fall residence hall contract, further disciplinary action by the University, and/or legal consequences such as arrests, tickets and fines, and future appearances in local courts. For each orientation session we offer a concurrent Parent & Family Orientation program. Students and their parents & adult family members follow separate orientation schedules. and information about commuting or living on campus. The undergraduate orientation fee includes up to two parents or adult family members' participation in orientation. Additional guests may be added (at a rate of $25 per person for meals and materials) by contacting our office at 856-256-4041 at least one week prior to the orientation program you would like to attend.